Pisa was a former Roman naval base and commercial port. Trade with Muslim Spain, North Africa and Lebanon generated tremendous wealth for this maritime power from the 11th to 13th centuries Arabic numerals were introduced to Europe through Pisa. 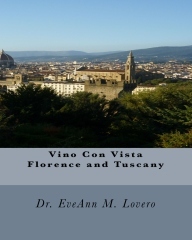 By 1406, the city was conquered by Florence. 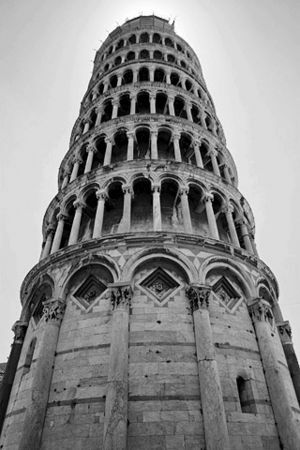 The iconic Leaning Tower of Pisa, and its spiral staircase of 294 steps is one of the most famous Italian monuments in the world. 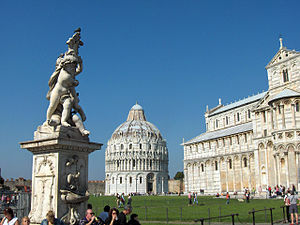 The Piazza dei Miracoli or Piazza of Miracles, hosts four gleaming Medieval masterpieces: the Leaning Tower is also the Bell Tower, the Camposanto (the graveyard), the Baptristery and the Cathedral. The Baptistery and Cathedral ; Duomo of Santa Maria Assunta are “Pisan Romanesque.” It was constructed with the intention of preserving “holy land” from Palestine. The UNESCO World Heritage site stands in a large green expanse, known as the “Field of Miracles” and was inscribed in 1987. The Piazza del Duomo houses a group of splendid monuments known throughout the world. These four masterpieces of medieval architecture were influenced by Islamic architecture. They include: the Cathedral (1064), the Baptistry (1154), the Campanile (1173) which is the famous gravity defying “Leaning Tower of Pisa” and the cemetery (1277). The tower was designed to be vertical, but it appears to have been doomed from the start. the first stones were laid down on a slippery substrate of clay, fine sand and shells. Work ceased in 1178 after only three stories had been constructed. The unstable subsoil caused the Tower to tilt and subside. As the angle of the tilt deepened, the structure began to rotate on its axis, causing its south side to begin moving up toward the surface. In 1272, heavier materials wee introduced to counterbalance the pull of the lean, Between 1991 and 2001, the foundations werre subjected to serious rehabilitation with an engineering feat that involved experimenting with soil extraction methods. The cemetery houses Roman sarcophagi and frescoes damaged by WWII bombs that have been restored. 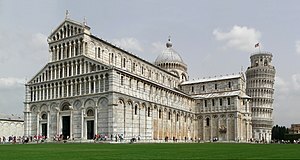 Pisa’s Duomo is considered the finest Pisan-Romaneque building in Tuscany with its tiered façade, colonnades, arcades and beautiful bronze doors. 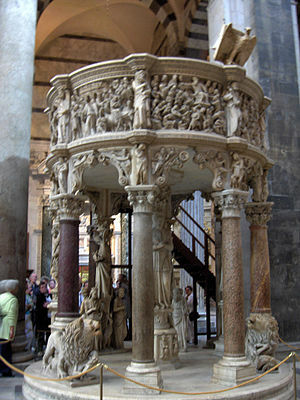 Giovani Pisano’s magnificent carved pulpit represents the life of Christ (1301-11). The Museo dell’Opera del Duomo contains casts of the fountain stones of each of the buildings beginning in 1064. Andrea del Sarto’s “St Agnes and Lamb”; Tino da Camaino’s “tomb of Emperor Henry VII, as well as Cimabue’s 1302 mosaic “Christ in Majesty” are housed in the Duomo. In the Duomo Museum, Giovanni’s “Madonna and the Crucifix” was carved in ivory in 1299; the natural shape of the tusk contributes to her stance. The white marble Romanesque Baptistery was designed by Dioti Salvi in 1152 and completed in 14th century in the Italian Romanesque style. It has decorated, columned, surface arcading made of white inlaid marble with gray bands. It it thought that he designed the baptistery to resemble the Church of the Holy Spulchre in Jerusalem. It was structurally renovated between 1990 and 1999. It contains a beautiful pulpit by Nicola Pisano and a central font by Guido Bigarelli of Como. The cylindrical structure has amazing acoustics. The roof of the Baptistry is double-domed..
Pisan artists had a great influence on monumental art in Italy from the 11th to the 14th century, which is reflected in the work of Bonanno and Giovanni Pisano. The National Museum of St. Matthew on the banks of the Arno River, has a wonderful collection of Tuscan painting and sculptures including: Francesco Traini’s “Scenes from the Life of St. Domenic”, Fra Angelo’s “Christ” and Donatello’s bust of San Rossore. Attend the annual “Unica Terra di Vino” in December.This wine Festival will be held at the Stazione Leopolda and features 60 producers from the Pisa Province. 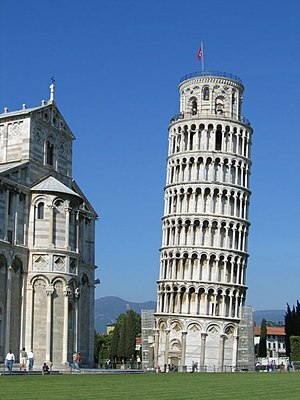 The International Pisa Marathon is on December 19th and starts at the Piazza dei Miracoli. Corso Italia and Borgo Stretto are draped with holiday lights. 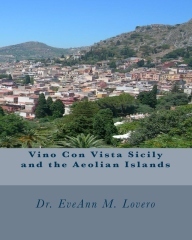 There are Holiday Markets on Via Paparelli, under the Logge di Bianchi and at Largo Ciro Menotti. Attend the Pisa Gospel Festival in December. Christmas concerts are held in many churches: the Church of San Nicola on December 5ht, Santo Stefano on December 10th and the church of San Francesco on December 19th featuring the music of Bach and Vivaldi. 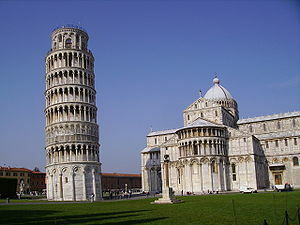 Opera Primaziale will perform on December 18th in the Cathedral of Pisa in Piazza dei Miracoli. The Church of San Martino will host a presepi exhibit until January 9th. 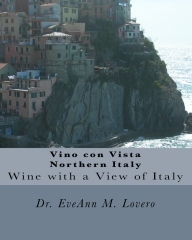 On December 29th attend the Volterra Mercato & Gusto. Attend the annual Cigoli Artistic Nativity Scene and Market of Solidarity at the Santuario Maria Madre dei Bambini in Cigoli Miniato. This is one of the largest nativity scenes in Tuscany. 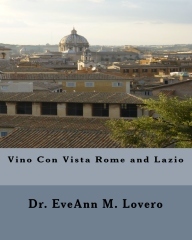 There are many “Vino con Vista” opportunities at the cafes near the Leaning Tower. In Marina di Pisa, have some lunch and a glass of Bianco Pisano at Miracles Café on Via P. Agostino da Montrefeltro on the seafront terrace. 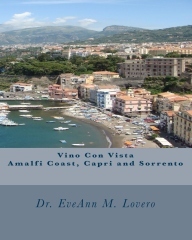 Visit the Castellina Maritima Winery on Via Bagnoli (www.terriccio.it). Order a Foresta on Via Litoraneaz for a great view. There is a newly renovated Bagni Di Pisa Natural Spa Resort (www.bagnipisa.com). It was the former summer resort of the Grand Duke of Tuscany. 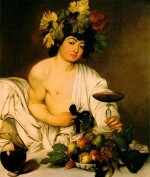 For a real treat, stay at the Relais dell’Orologio on Via della Faggiol (www.relaisdellorologio.com). Ristorante Enoteca Dante e Ivana in Tirrenia @ Viale Tirreno. Enjoy the “Tomato Soup with Tyrrhenian batarga” to get the charming collector plate. It works well with a glass of Bianco Pisano di San Torpe. The seaside veranda is a lovely place to dine and enjoy the view. Ristorante-Enoteca Del Duca inVolterra @ Via di Castello, 2. The signature dish is “Ribollita with wood pigeon and volterra truffles.” This soup should be accompanied by a glass of red wine. The restaurant is located in the prestigious Palazzo Inghirami. Must Eat! When in Pisa, the Choice is Panini.